There are 18 posts in this thread, and it has been viewed 31387 times. How do you rate Neo Bomberman? NOTE: This was a previous Game of the Week discussion. 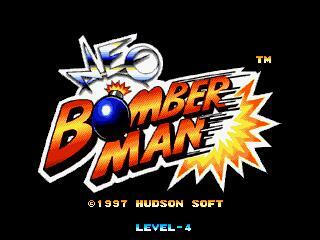 Neo Bomberman was Hudson Softs Neo Geo iteration of the series. They'd already done a Bomberman style puzzle game a couple of years earlier so it was probably about time it got one, seeing as every console and computer since the 80's has had a Bomberman game pretty much. However, while it's a decent game, the main problem is the Neo Geo's lack of 4 player support, leaving this one feeling a little bit empty in multiplayer. It's still a good game, but the question has to be asked... unless you are a completist, is it worth owning this when you could get a quite possibly superior version on another system for a cheaper price? Overall, this is a good game, but the lack of a true multi-player mode is very frustrating and means that it's not as good as it could/should have been. Music will be available in the Jukebox as soon as it starts working again... hopefully soon! Honestly, I make that same mistake each week when I copy/paste the layout for the GotW... /me is so dumb! I have played the SNES Super Bomberman games - esp 1 and 2 with friends - all evening - sometimes for hours. I really never play in one-player mode - there just seems no point. Its ok with 2 players but its just not the same as a 3-player or 4 player battle. Having said that - I have never played this game - so maybe it has hidden properties. I love Bomberman, so naturally, I love this game! My only complaint is that multiplayer mode only features 2 players, not even CPUs. The single player mode seems to make up for it, though. 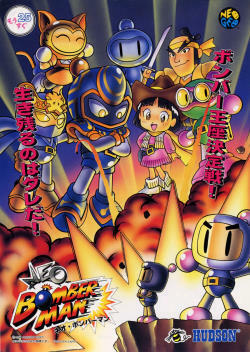 Its a bit of a disappointment, but, this is the only Bomberman game that features a Cat Bomber!! No complaints here! I OWN BOMBERMAN 1 & 2... on the snes, and I've tried to like them (like all my friends... and all you guys do!) but, even though I don't dislike them entirely, I just, have never really got on with puzzle-esque games at all. 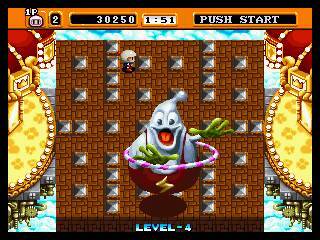 BomberMan sadly, regardless of its multiplayer appeal, has never ever caught on with me. Its not for me... even if it is available on the NeoGeo! SO THERE YOU HAVE IT... there is at least one person in the world who doesnt have a passion for the mighty bomberman. Sorry Guys. It's been a long time since I played this game so I just had a session. It's alright for a few quick games but doesn't really hold my attention for long. 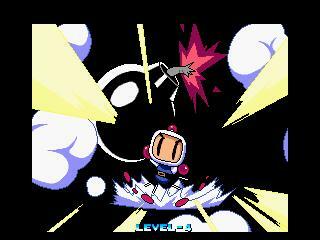 I've never been all that interested in the Bomberman games and have only played them through emulation. Then again I've only ever played them in single player mode and they would I'm sure be a lot better with some human opponents. merlin: I would definitely try one against friends. I can honestly say that playing the Xbox 360 one against a bunch of other people is some of the best fun you can have - it is better in person so you can trash talk better, but online is great fun too. I'm not very good at it but it's just great fun. Yeah Bomberman rules in multiplayer - you end up playing for hours and you don't even know it! I think I am the only person who can't play games when I drink - I just lose all interest and can't be bothered. Also I used to hate playing games when I came back from the pub/club - they always used to say in mags how a certain game was great to play when you come back from the pub (notably Wipeout). I'll probably eventually get Bomberman for my Snes and then I can have some multiplayer games. I guess playing this on your own would probably get a bit boring for most people. I only really enjoy games drunk when with friends, provided you are all just as shitfaced as each other. Many games can be very entertaining... Bomberman is great, or try playing Buzz on the PS2/PS3 when you are drunk. Some very funny Eye Play Camera stuff happened a few weeks back when I played Buzz round my friends house... I shall say no more of that in this thread though! Yes I imagine some games are pretty good when drunk - stuff like Buzz etc I've never tried drinking games with video games, maybe sometime in the future - when I can drink again. 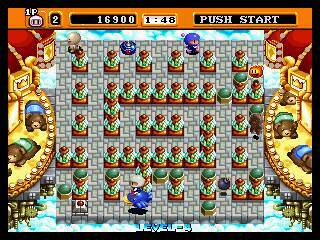 Bomberman - must take a drink every time you get blown up and so on. Depending on what you are drinking it can be very very bad, and not necessarily advised!